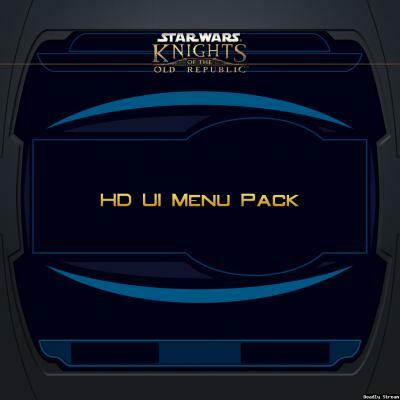 HD UI Menu Pack for Knights of the Old Republic v1.1 - 20180318 by ndix UR (DeadlyStream user) This modification adds high resolution UI menu textures. 2K is the base resolution. The content is redrawn vector art, no modified scale-ups here. It is focused on menu backgrounds, and includes some of the overlay components for the menus. Pure Vanilla (PV) Edition aims to provide the closest match to the original menu texture assets. This mod doesn't touch a lot of the 'extra' menu-like GUI elements yet, such as the galaxy screen, computer interfaces, pazaak, etc. It also doesn't mess with the main menu at all yet. Requirements You must be running menus at a high resolution for this to really work. At the default menu size, this mod will probably look bad. You must have KotOR High Resolution Menus or an equivalent mod installed for good results. Known Issues The original textures were for 640x480 menus. The 4x sized textures in this package would look best at 2560x1920, which nobody really uses. If your display is less than 2560px width, you may experience seams where different textures are intended to meet seamlessly. The game just isn't that good at scaling UI textures with alpha channels used for transparency. There's nothing I can really do about it. There are some sprites in the menu processes that haven't made it into the package yet. They may sometime. I've added x/y clamping to some textures that should have transparent edges over 3D backgrounds. It makes the transparent edges work well, but the diffuse edges work less well. It seems you can't have it both ways, and this is the trade off. Install / Uninstall To install, copy the files from the package Override/ folder to the Override/ folder for your KOTOR game installation. To uninstall, remove the TPC files for this package from your KOTOR game Override/ folder. Legal THIS MODIFICATION IS NOT MADE, DISTRIBUTED, OR SUPPORTED BY OBSIDIAN, OR LUCASARTS ENTERTAINMENT COMPANY LLC. ELEMENTS TM LUCASARTS ENTERTAINMENT COMPANY LLC AND/OR ITS LICENSORS. The content of this mod is free for use and reuse, with no implied warranty, you can redistribute it, in original or modified form. If you do, a credit of some kind is nice but not required. READ THIS FIRST!!!!!! WARNING, IF YOU HAVE THESE FILES IN YOUR OVERRIDE FROM THE FIRST VERSION OF THE MOD, THEN REMOVE THEM FROM THE OVERRIDE!!!! m14ac.git m14ae.git m18aa.git m18ab.git m18ac.git m20aa.git m24aa.git m25aa.git m27aa.git m35aa.git m36aa.git m37aa.git m38aa.git m38ab.git m39aa.git m41ac.git m42aa.git m44ab.git m45aa.git PART 1 (PART 2 IS WAY DOWN BELOW, MAKE SURE YOU READ THAT TOO!!!!} Hey there everyone! This is my first lightsaber mod that I've made, so go easy on me alright? This mod adds in plenty of lightsabers to the game to keep you satisfied, all customized as well as upgradeable. Every crystal except for one includes all three variations of the lightsabers (Short, normal, and double-bladed) Anyways, this mod includes the following: 8 Solid-colored, awesome looking lightsabers 7 Duel-colored, awesome looking lightsabers (The core and outer glow are different colors) 5 Color changing, amazing animated lightsabers. That might be a bias opinion, but oh well I have randomly placed the lightsabers throughout the game, some are hidden, others are in obvious areas. I wanted to mention however, that there is one lightsaber that is hidden so well, I don't think anyone will be able to find it. Trust me, it's really well hidden, and in an unexpected spot. WARNING (YES, I HAVE TO TYPE IT IN ALL CAPS): THERE IS ONE LIGHTSABER (The very well hidden one) THAT IS ONLY AVAILABLE IN THE DOUBLE-BLADED FORM!!!! 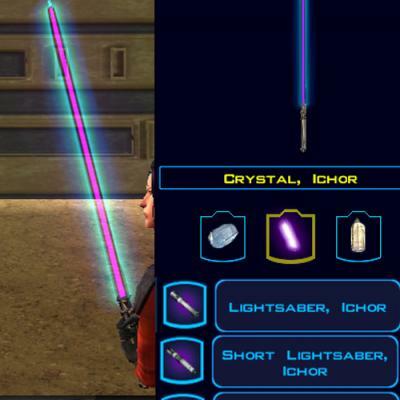 IF YOU TRY TO PUT THE CRYSTAL IN A SHORT OR NORMAL LIGHTSABER, IT WILL GLITCH OUT THE ITEM, AND DISAPPEAR! BE CAREFUL! Installation: Just run the TSLPatcher and let it do its work. Manual: Copy and paste all items into your override, but be careful since there's an upcrsystals.2da, which could severally mess up te lightsabers if you have any other mods. I can't guarantee compatibility. Uninstallation: Remove all of the files from your override, and throw in the backup of the upcrystals.2da into your override. Anyways, while I always prefer people to find the items in-game itself, you can always cheat them in. Here are the codes for every item: Burning White: g_w_lghtsbr50 g_w_shortsbr50 g_w_dblsbr050 g_w_sbrcrstl50 Alizarin: g_w_lghtsbr51 g_w_shortsbr51 g_w_dblsbr051 g_w_sbrcrstl51 Brandeis: g_w_lghtsbr52 g_w_shortsbr52 g_w_dblsbr052 g_w_sbrcrstl52 Fuchsia: g_w_lghtsbr53 g_w_shortsbr53 g_w_dblsbr053 g_w_sbrcrstl53 Sapphire: g_w_lghtsbr54 g_w_shortsbr54 g_w_dblsbr054 g_w_sbrcrstl54 Dartmouth g_w_lghtsbr55 g_w_shortsbr55 g_w_dblsbr055 g_w_sbrcrstl55 Cadmium: g_w_lghtsbr56 g_w_shortsbr56 g_w_dblsbr056 g_w_sbrcrstl56 Alloy: g_w_lghtsbr57 g_w_shortsbr57 g_w_dblsbr057 g_w_sbrcrstl57 Catalyst: g_w_lghtsbr58 g_w_shortsbr58 g_w_dblsbr058 g_w_sbrcrstl58 Red Lightning: g_w_lghtsbr59 g_w_shortsbr59 g_w_dblsbr059 g_w_sbrcrstl59 Paragon: g_w_lghtsbr60 g_w_shortsbr60 g_w_dblsbr060 g_w_sbrcrstl60 Ichor: g_w_lghtsbr61 g_w_shortsbr61 g_w_dblsbr061 g_w_sbrcrstl61 Arcanum: g_w_lghtsbr62 g_w_shortsbr62 g_w_dblsbr062 g_w_sbrcrstl62 Kairos: g_w_lghtsbr63 g_w_shortsbr63 g_w_dblsbr063 g_w_sbrcrstl63 Lovat: g_w_lghtsbr64 g_w_shortsbr64 g_w_dblsbr064 g_w_sbrcrstl64 Malachite: g_w_lghtsbr65 g_w_shortsbr65 g_w_dblsbr065 g_w_sbrcrstl65 Gamboge: g_w_lghtsbr66 g_w_shortsbr66 g_w_dblsbr066 g_w_sbrcrstl66 Amethyst: g_w_lghtsbr67 g_w_shortsbr67 g_w_dblsbr067 g_w_sbrcrstl67 Xanadu: g_w_lghtsbr68 g_w_shortsbr68 g_w_dblsbr068 g_w_sbrcrstl68 Then there's the secret one that I'm not giving the codes for. Remember, don't use that one in a lightsaber other than a double-bladed!!!! Btw, in case you do find it, it's called: "Ultimatum" and it's pretty funky/weird… I hope you guys enjoy this mod! Leave suggestions for me either by PM on DS, LF, YouTube, or on my WIP thread on DS!!! Youtube=RealRece Star Wars Gaming Credits: Fair Strides for helping me a lot like always, and making the TSLPatcher (I actually ended up making it, but he helped guide me through making it). Thanks to all of my fans out there who said some great things about this mod while I was working on it, and for encouraging me to continue it. Also for making suggestions for several lightsabers too! PART 2 This is part two of the readme, so whatever I guess. I'll make this one shorter. Anyways, the second mod of this mod adds in 20 new power crystals to the game. (The ones that actually give the lightsabers stats!!!) I really hope you guys understand how tedious the 1,800 tests were. Yes, 1,800 tests. Now, I know that's noter like what Hassat Hunter had to do for TSLRCM, but that's still a lot in my opinion. Anyways, I included the saber crystals to different areas of the game. You will find one power crystal with one of the other lightsabers, so that's a bonus. Can you get lucky and find the really good ones??? We'll see While I prefer you to actually find the crystals in-game, you can always cheat them in… Here are the codes for the crystals: (I'm too lazy to list the names and the codes, so I'm only listing the codes…) g_w_sbrcrstl01 g_w_sbrcrstl02 g_w_sbrcrstl11 g_w_sbrcrstl12 rececrstl71 rececrstl72 rececrstl73 rececrstl74 rececrstl75 rececrstl76 rececrstl78 rececrstl80 rececrstl81 rececrstl82 rececrstl83 rececrstl84 rececrstl85 rececrstl86 rececrstl88 rececrstl89 Hope you all enjoy this mod!!!! Special Thanks: Thank you to all of my supporters out there who really were excited to see this mod come out. I spent a lot of time working and testing out these crystals and sabers. Again, 1,800 minimum tests. And thanks to Varsity Puppet and Darth InSidious for help on trying to fix a problem that i was having. Thanks to Fair Strides again for helping like always, and finding the problem. Thanks to him, I was able to come up with a fix of the problem, although it isn't very pretty. Hey there everyone! First off, thanks for downloading my mod! I really appreciate every fan that I have out there, so thanks again! This is TSLRCM compatible. Alright, who cares about introductions right? Let's get right down to what this mod is. So, I added 51 new power crystals to the game. Each one does a couple of special things to your lightsabers that I don't think most people have done. (well, in the sense that I haven't seen anyone really come out with a crystal mod like this.) Anyways… I placed every crystal to pop up in certain situations (i.e: certain dialog options, what classes you choose, etc…) as well as placed them randomly throughout the game. Well, yeah that's about as much as I can say honestly. I really hope you guys do find this mod pretty interesting. I am a bit too lazy to type out every crystal, with it's stats and what-not. I'll type out the codes (although I REALLY, REALLY want you to find the crystals in-game instead of cheating. 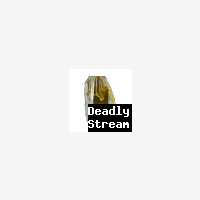 If you want to know which crystal code belongs to which, check out my WIP on Deadlystream and look for the numbers after each crystal name. http://deadlystream.com/forum/topic/3134-reces-projects/page-4 http://deadlystream.com/forum/topic/3134-reces-projects/page-5 Anyways, here are the codes! They're pretty simple, just: rececrstl200 all the way to 250. Here's a little sneak peak at how some of the crystals work: INSTALLATION INSTRUCTIONS: There are two ways, depending on which file you downloaded. There's the TSRCM version, and the non-TSLRCM version. They are both easy to install, so yeah. Anyways, just run the TSLPatcher and it'll automatically install every file. For the non-TSLRCM version, you'll just have to cheat all of the items into the game. 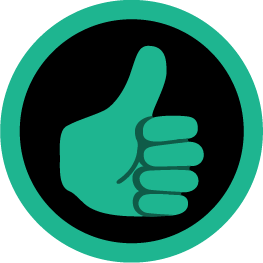 UNINSTALLATION INSTRUCTIONS: Just remove all of the files from your override, and replace any backups found in the backups folder. COMPATIBILITY ISSUES: Unfortunately, this mod is NOT compatible with a mod like SLM. I believe it is for Duplisaber, so that's always good PERMISSIONS: You may NOT redistribute this mod without my consent. Ask me on any site, like DS, YouTube, Steam, etc… and I will tell you if you can put my mod somewhere else. And now for my special thanks: Fair Strides is first and foremost as he is for every one of my mods. I mean, I can't describe how helpful and how much of an awesome guy he is. It's just beyond me that I know someone like him. He helped me with scripts (as with every script that I have to make) as well as help with guiding me through making certain parts of the TSLPatcher. 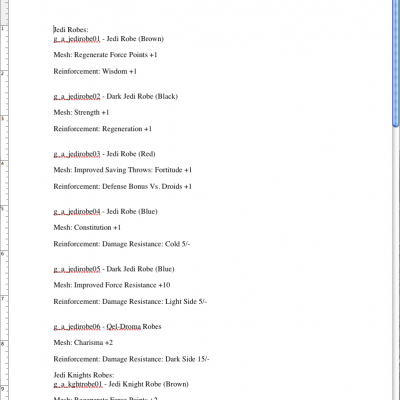 Malkior for some recommendations on crystal names, stats, and descriptions. Akko for suggesting a crystal to me, which I made the description make it seem like it's his crystal . Everyone out there who commented on my posts as well as kept up the support. Oh, and thanks Xuul for that comment, I never would have thought you would comment on one of my projects haha. Well, you did make a mod review for my bad mod that I made haha. Anyways… Enjoy! 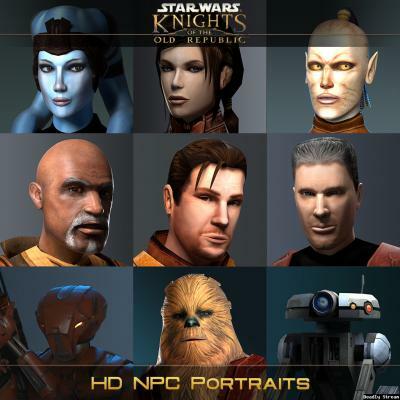 HD NPC Portraits for Knights of the Old Republic v1.1 - 20180306 by ndix UR (DeadlyStream user) This modification adds high resolution rendered portrait images for NPCs. The 1K portraits have 256x the resolution of the 64x64 originals. The portraits are rendered to match the poses, colors, and lighting of the vanilla portraits as closely as possible given the following constraints: Unable to adjust facial expressions via skin deformation Only vanilla textures (and my own additional maps based on same) are used While the textures are quite low-res, most of the work was in material setup using a modern rendering engine, so even the vanilla textures still wind up looking much better than they have any right to. This is because of real lights, shading, and material properties, of which the original diffuse textures are only a part. That said, only materials that could be divided along existing geometry were separated, which prevented me from being able to do some things I would have liked to, especially for HK & T3. I didn't really redo geometry, beyond appropriate use of edge split and subdivision surface modifiers. It also includes 1K versions of the darkened placeholder portraits before you meet characters in-game. BONUS There's a portrait for Trask Ulgo, because why not. This package includes a portrait for Shadow, from Brotherhood of Shadow: Solomon's Revenge. If you are not using that mod, you don't need the included PO_channa.tpc. BOS:SR includes many portraits, maybe I will do a separate package for them. Thanks to Silveredge9 for the blanket approval to use assets from his mods, without which I would not have released Shadow. INSTALL / UNINSTALL To install, copy the TPC files from the package Override/ folder to the Override/ folder for your KOTOR game installation. To uninstall, remove the TPC files for this package from your KOTOR game Override/ folder. LEGAL THIS MODIFICATION IS NOT MADE, DISTRIBUTED, OR SUPPORTED BY OBSIDIAN, OR LUCASARTS ENTERTAINMENT COMPANY LLC. ELEMENTS TM LUCASARTS ENTERTAINMENT COMPANY LLC AND/OR ITS LICENSORS. The content of this mod is free for use and reuse, with no expressed or implied warranty; you can redistribute it, in original or modified form. If you do, a credit of some kind is nice but not required. First of all: THIS IS TSLRCM/M4-78 COMPATIBLE (That's great news of course) Be sure to download every single file in the downloads! You don't want to miss out on all of the files! Hello there everyone! Guess what? I have another mod, third one this week. Now, then again these took a long time to do. Except since my internet was down for 4-5 days this week, I had a lot of time to work on this mod. What this mod does is replace the vanilla armors with new, HQ textures. This mod also (just like my K1 mod) replaces the stats to make you want to use the lighter armors. All of the armors and clothing replace the core games files. I adjusted the stats of every item (Except for clothing). I made it so that people would want to use the lighter armor, so be aware of the heavy armor. I'm really proud to say that I'm starting to work on more projects along with this one. The fact that I'm making these on a Mac make me want to keep making them, to "prove" to people that you can still mod on a Mac haha. The codes for all of the armors are the same as the vanilla codes, so look them up. I didn’t replace the games core game robes. I placed them randomly through the game. The codes for the robes (Although I'd prefer that you find them in their places inside of the game, are as follows: giveitem a_robe_50 (through) 60 Installation: Unzip all of the separate 7z files, and then place all of the files into the override. I really hope you guys enjoy this mod, be sure to make a review so that I can improve on anything! 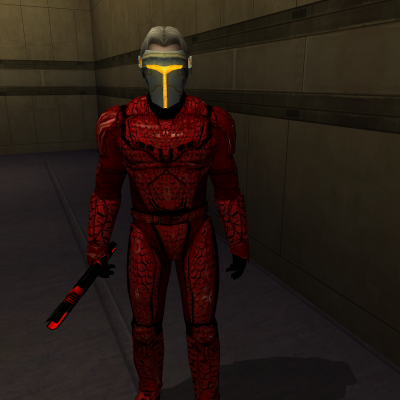 Kotor Retextured Clothing I'm very proud to announce that Malkior, and I have teamed up to make this mod. 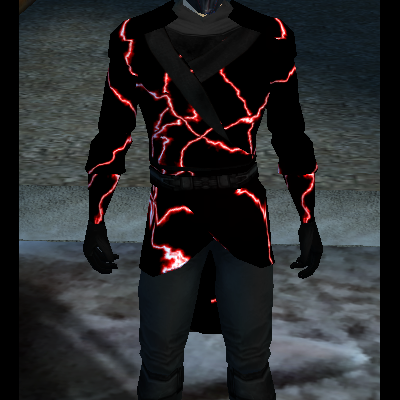 Basically what this mod will do is replace all of the boring normal clothing/armor/robes from Kotor 1 and replace them with cooler textures, new stats for them, and other things. Just a heads up, some armors might look a little goofy, but I wanted to replace the boring stuff from the vanilla game I edited all of the textures, editing uti’s and collaborated with community members about certain things. Malkior extracted several files (robe files), edited the robes uti’s, and guided me through this very interesting first project (for me). This is my first mod, and I did this all on a Mac. See, Mac players can mod too I would like to thank those of you who suggested several textures, stats, and other things to help me out through this process. I’d like to thank forgetcanon for helping me through the process of getting Kotor Tool to work on my Mac. I’d also like to thank Malkior for guiding/helping me through my first mod, and not backing off even though I rushed him with the robes on my last day of editing (sorry). Finally, I’d like to thank Fair Strides for everything that he has done for me. Even though I’ve only known him for about a month, he’s helped me more than anyone else has with gaming. All of the armors and clothing replace the core games files. I adjusted the stats of every item (Except for clothing). I made it so that people would want to use the lighter armor, so be aware of the heavy armor. And by the way, there’s one armor that I purposefully made super over powered. It costs 100,000 credits, so be ready to spend some money. The codes for all of the armors are the same as the vanilla codes, so look them up. I didn’t replace the games core game robes. I placed them randomly through the game. Installation: Unzip all of the separate 7z files, and then place all of the files into the override. I really hope you guys enjoy this mod, be sure to make a review so that I can improve on anything! How can I find the default texture files for KotOR? I'm planning on reducing the Graphic Modification v5.0 textures to vanilla size, as I love the style of the mod, but I have yet to upgrade from 128MB of VRAM. Thing is, in order to reduce them to vanilla, I first need to know the size of each vanilla file. So I've been tinkering around in the game files, trying to figure out where and how to extract them, but to no avail. If I can't figure it out, I guess I'll just reduce them all by 50 or 75%. Also, because these textures were originally from a Russian site, asking permissions to upload a reduced version here might be difficult. If I can't find a way to reach the original author (Dark Hope? ), would I be allowed to post my changes on this site if my little project works out? Hey guys! I'm proud to announce that I'll be regularly updating you guys about my mods. Now that I've got plenty of tools working and so on, I can finally say that I can maybe do some more mods First mod that I'll be updating you guys about is my Lightsaber mod for Kotor 1. This mod will recolor the vanilla saber colors, just making them slightly more colored (while still maintaining the same general color, also making them more vibrant. I'll also be adding several different mix and matched colored blades too! I'd say that this mod is about 25% done. I'll also be collaborating with VP (He'll be my "mentor" for this. He'll be helping me with making these crystals customized in the game (ability to put them into sabers, while having their own too). I got the crystals to be in the game, just not separate from the Vanilla crystals. 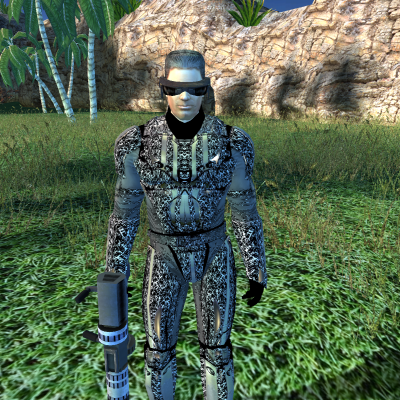 The second mod that I'd like to announce is a "sequel" to my K1 Retextured clothing mod. This one has taken some time to work on and has really taken out a lot from me by retexturing every armor/robe (I know that that's nothing to most of you modders out there, but this is one of my first couple of mods ) This mod will do the same thing as the first one, changing textures (making them HQ also), changing stats, etc... This is I'd say about 75% complete since my internet was down for about five days, so I worked about 6-8 hours throughout this week.